Often times, we get so busy we want to ask an employee or hire someone to take care of our Facebook Business Page. Here are instructions for making someone an admin/manager so they have full access. 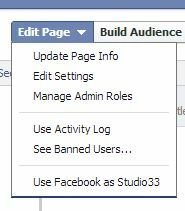 I won’t go into a rant here but if use a profile instead of a Facebook Business page for your business, you’re missing out on many features (not to mention Facebook guidelines state that you must use a business page for business purposes not a profile). I’ll write more about the advantages of having a Facebook Business page later. Before you start, be sure the person you’d like to make admin has Liked your page. Start typing in the name or email of the person and choose him/her from the drop down that pops up. From the drop down menu, choose the role you’d like that person to perform. For our purposes, choose Manager (Admin). Click “Save” and enter your password. Click “View Page” on top right to go back to your page.